George Loddiges was in for a shock. 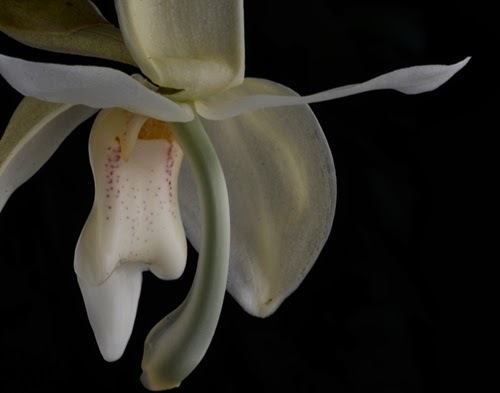 When the medium sized orchid with fluted pseudobulbs that he and his father Conrad (1738-1826) nurtured finally flowered for the first time in 1827, even he, an experienced orchid grower and heir to the influential Loddiges Nursery, must have been taken aback. Our plant flowered in the Fuqua Orchid Center this September and it stopped me dead in my tracks. I reversed course and closed in for a better look. Exceedingly large, yes, even for a Stanhopea. Waxy, glossy and powerfully fragrant of wintergreen. According to Whitten and Williams the fragrance is composed mostly of benzyl-acetate (wintergreen), with smaller amounts of limonene (citrus) and cineole (camphor). It's a stunner. Loddiges' description of his growing methods is fascinating. His "stove" was his famous hothouse, an innovative structure for its time. His potting materials, which must have been local in origin (no Chilean moss, perlite or tree fern fiber in those days), are just as interesting. They were a striking departure from the conventional soil-based growing media of his day. He must have learned that garden soil wouldn't work for an epiphytic orchid. Instead he chose moss (What kind, I wonder), sawdust (What grade? softwood? hardwood? Did his plants become nitrogen deficient?) and sand (Didn't it reduce aeration?). By all accounts his methods were a brilliant success. Loddiges must have been an attentive and creative grower. If the current trend toward local sustainable materials continues I can imagine relatively small operations like ours, located in a suitable climate, could grow live sphagnum moss (outdoors in shallow plastic-lined beds) for their own use as an orchid potting medium. 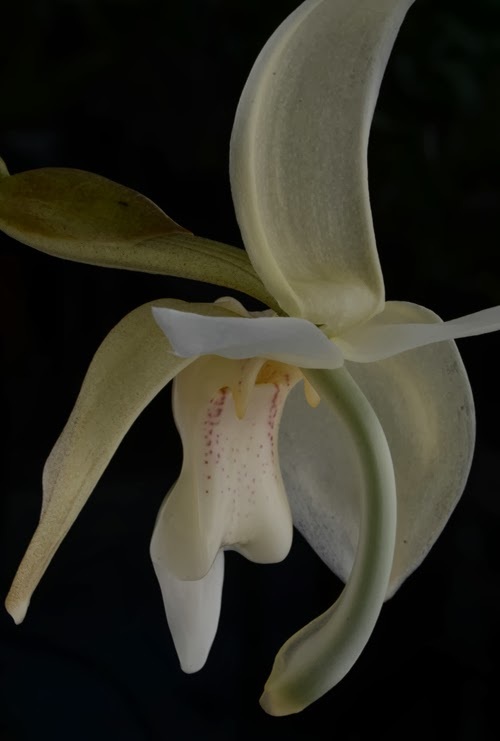 Stanhopea grandiflora grows as an epiphyte between 100 and 1000 meters elevation around the Amazon basin along the eastern slopes of the Andes in Peru and Colombia; also in Venezuela, the Guianas and Brazil; and the island of Trinidad. It is pollinated by Euglossine bees.